I use a REGULAR (for home-use, not for electronics) hot air gun to desolder non-SMD components from PCBs. The components are really hot (naturally) after desoldering and it takes a while until they cool off. Is it better or worse if I cool then off in water? My issue is related to the fast cooling interval that will appear when I drop the hot component into the water. Water will create thermal shock because of it's low boiling point and high specific heat (capacity to absorb heat), it's proabably one of the fastest ways to cool down a PCB or part. Another way to do it would be to turn a can of dust off upside-down and spray your parts down. But you don't want to do that, the parts will cool down too fast and you could break them. In fact it's probably a good idea to slowly back away the hot air gun away from the part to let the temperature ramp down. Or turn the temperature down on the heat gun and let the part cool off a little before removing the heat. For large parts such as BGA's a thermal profile isn't just a good idea, the part will not function correctly if the thermal profile is not followed. Because the pads on a BGA are so small, and the solder connection so small that thermally shocking the solder can introduce discontinuities in the solder connection itself. The nice hot air guns for BGA's can also follow a profile. 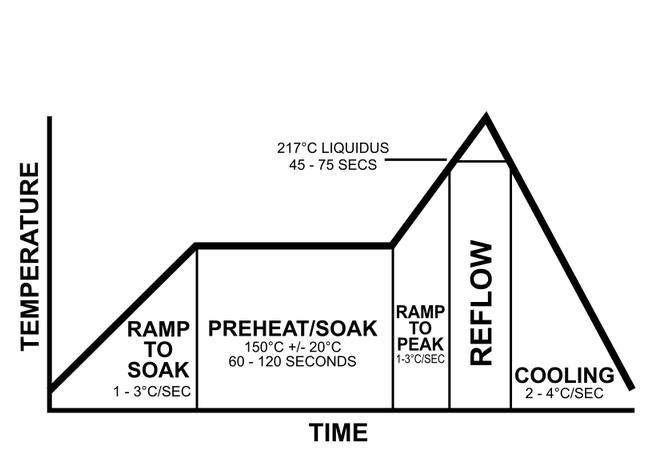 It's really hot in a reflow oven and the purpose of the Mfg thermal profile is to avoid thermal shock, ramp slowly then peak quickly above solder liquidus temp for a not to exceed x seconds and then cool slowly with a controlled ramp. Worse yet components that have absorbed moisture due to the class code of the seal ( e.g. clear epoxy LEDs fit in this category) extended periods of unsealed exposure followed by rapid heating thru 100'C can cause a popcorn failure inside that shears the whisker gold wire bond, that may not be visible. It's probably a bad idea to cool semiconductors (as answered above), however parts such as connectors (i.e. metal and plastic) seem to survive much better if cooled off immediately, in my experience. Not the answer you're looking for? Browse other questions tagged pcb soldering pcb-fabrication cooling water or ask your own question. Can I dip a soldering iron in water to cool it down? How to hold SMD parts in place while soldering?